Of the clan Macfarlane, Mr Skene gives the best account, and we shall therefore take the liberty of availing ourselves of his researches. According to him, with the exception of the clan Donnachie, the clan Parlan or Pharlan is the only one, the descent of which from the ancient earls of the district where their possessions were situated, may be established by the authority of a charter. It appears, indeed, that the ancestor of this clan was Gilchrist, the brother of Maldowen or Malduin, the third Earl of Lennox. This is proved by a charter of Maldowen, still extant, by which he gives to his brother Gilchrist a grant "de terris de superiori Arrochar de Luss"; and these lands, which continued in possession of the clan until the death of the last chief, have at all times constituted their principle inheritance. But although the descent of the clan from the Earls of Lennox be thus established, the origin of their ancestors is by no means so easily settled. Of all the native earls of Scotland, those of this district alone have had a foreign origin assigned to them, though, apparently, without any sufficient reason. The first Earl of Lennox who appears on record is Aluin comes de Levenox, who lived in the early part of the 13th century; and there is some reason to believe that from this Aluin the later Earls of Lennox were descended. It is, no doubt, impossible to determine now who this Aluin really was; but, in the absence of direct authority, we gather from tradition that the heads of the family of Lennox, before being raised to the peerage, were hereditary seneschals of Strathearn, and bailies of the Abthanery of Dull, in Athole. Aluin was succeeded by a son of the same name, who is frequently mentioned in the chartularies of Lennox and Paisley, and who died before the year 1225. In Donald, the sixth earl, the male branch of the family became extict. Margaret, the daughter of Donald, married Walter de Fassalane, the heir male of the family; but this alliance failed to accomplish the objects intended by it, or, in other words, to preserve the honours and power of the house of Lennox. Their son Duncan, the eighth earl, had no male issue; and his eldest daughter Isabella, having married Sir Murdoch Stuart, the eldest son of the Regent, he and his family became involved in the ruin which overwhelmed the unfortunate house of Albany. At the death of Isabella, in 1460, the earldom was claimed by three families; but that of Stewart of Darnley eventually overcame all opposition, and acquired the title and estates of Lennox. Their accession took place in the year 1488; upon which the clans that had been formerly united with the earls of the old stock separated themselves, and became independent. Of these clans the principal was that of the Macfarlanes, the descendants, as has already been stated, of Gilchrist, a younger brother of Maldowen, Earl of Lennox. In the Lennox charters, several of which he appears to have subscribed as a witness, this Gilchrist is generally designated as frater comitis, or brother of the earl. His son Duncan also obtained a charter of his lands from the Earl of Lennox, and appears in the Ragman's roll under the title of "Duncan Macgilchrist de Levenaghes". From a grandson of this Duncan, who was called in Gaelic Parlan, or Bartholomew, the clan appears to have taken the surname Macfarlane; indeed the connection of Parlan both with Duncan and with Gilchrist is clearly established by a charter granted to Malcolm Macfarlane, the son of Parlan, confirming to him the lands of Arrochar and others; and hence Malcolm may be considered as the real founder of the clan. He was succeeded by his son Duncan, who obtained from the Earl of Lennox a charter of the lands of Arrochar as ample in its provisions as any that had been granted to his predecessors; and married a daughter of Sir Colin Campbell of Lochow, as appears from a charter of confirmation granted in his favour by Duncan, Earl of Lennox. Not long after his death, however, the ancient line of the Earls of Lennox became extinct; and the Macfarlanes having claimed the earldom as heirs male, offered a strenuous opposition to the superior pretensions of the feudal heirs. Their resistance, however, provided alike unsuccessful and disastrous. The family of the chief perished in defence of what they believed to be their just rights; the clan also suffered severely, and of those who survived the struggle, the greater part took refuge in remote parts of the country. Their destruction, indeed, would have been inevitable, but for the opportune support given by a gentleman of the clan to the Darnley family. This was Andrew Macfarlane, who, having married the daughter of John Stewart, Lord Darnley and Earl of Lennox, to whom his assistance had been of great moment at a time of difficulty, saved the rest of the clan, and recovered the greater part of their hereditary possessions. The fortunate individual in question, however, though the good genius of the race, does not appear to have possessed any other title to the chiefship than what he derived from his position, and the circumstances of his being the only person in a condition to afford them protection; in fact, the clan refused him the title of chief, which they appear to have considered as incommunicable, except in the right line; and his son, Sir John Macfarlane, accordingly contented himself with assuming the secondary or subordinate designation of captain of the clan. From this time, the Macfarlanes appear to have on all occassions supported the Earls of Lennox of the Stewart race, and to have also followed their banner in the field. For several generations, however, their history as a clan is almost an entire blank; indeed, they appear to have merged into mere retainers of the powerful family, under whose protection they enjoyed undistirbed possession of their hereditary domains. But in the sixteenth century Duncan Macfarlane of Macfarlane appears as a steady supporter of Matthew, Earl of Lennox. At the head of three hundred men of his own name, he joined Lennox and Glencairn in 1544, and was present with his followers at the battle of Glasgow-Muir, where he shared the defeat of the party he supported. He was also involved in the forgeiture which followed, but having powerful friends, his property was, through their intercession, restored, and he obtained a remission under the privy seal. The loss of this battle forced Lennox to retire to England; whence, having married a niece of Henry VIII, he soon afterwards returned with a considerable force which the English monarch had placed under his command. The chief of Macfarlane durst not venture to join Lennox in person, being probably restrained by the terror of another forfeiture; but, acting on the usual Scottish policy of that time, he sent his relative, Walter Macfarlane of Tarbet, with four hundred men, to reinforce his friend and patron; and this body, according to Holinshed, did most excellent service, acting at once as light troops and as guides to the main body. Duncan, however, did not always conduct himself with equal caution; for he is said to have fallen in the fatal battle of Pinkie, in 1547, on which occasion also a great number of his clan perished. Andrew, the son of Duncan, as bold, active and adventurous as his sire, engaged in the civil wars of the period, and, what is more remarkable, took a prominent part on the side of the Regent Murray; thus acting in opposition to almost all the other Highland chiefs, who were warmly attached to the cause of the queen. He was present at the battle of Langside with a body of his followers, and there "stood the Regent's part in great stead"; for, in the hottest of the fight, he came up with three hundred of his friends and countrymen, and falling fiercly on the flank of the queen's army, threw them into irretrieveable disorder, and thus mainly contributed to decide the fortune of the day. The clan boast of having taken at this battle three of Queen Mary's standards, which, they sau, were preserved for a long time in the family. Macfarlane's reward was not such as afforded any great cause for admiring the munificence of the Regent; but that his vanity at least might be conciliated, Murray bestowed upon him the crest of a demi-savage proper, holding in his dexter hand a sheaf of arrows, and pointing with his sinister to an imperial crown, or, with the motto, This I'll defend". Of the son of this chief nothing is known; but his grandson, Walter Macfarlane, returning to the natural feelings of a Highlander, proved himself as sturdy a champion of the royal party as his grandfather had been an uncompromising opponet and enemy. During Comwell's time, he was twice besieged in his own house, and his castle of Inveruglas was afterwards burned down by the English. But nothing could shake his fidelity to his party. Though his personal losses in adhering to the royal cause were of a much more substantial kind than his grandfather's reward in opposing it, yet his zeal was not cooled by adversity, nor his ardour abated by the vengeance which it drew down on his head. Although a small clan, the Macfarlanes were as turbulent and predatory in their way as their neighbours the Macgregors. By the Act of the Estates of 1587 they were declared to be one of the clans for whom the chief was made responsible; by another act passed in 1594, they were denounced as being inthe habit of committing theft, robbery, and opression; and in July 1624 many of the clan were tried and convicted of theft and robbery. Some of them were punished, some pardoned; while others were removed to the highlands of Aberdeenshire, and to Strathaven in Banffshire, where they assumed the names of Stewart, M'Caudy, Greisock, M'James, and M'Innes. Of one eminet member of the clan, the following notice is taken by Mr Skene in his work on the Highland of Scotland. He says, "It is impossible to conclude this sketch without alluding to the eminent antiquary, Walter Macfarlane of that ilk, who is as celebrated among historians as the indefatigable collector of the ancient records of the country, as his ancestors had been among the other Highland chiefs for their prowess in the field. The family itself, however, is now nearly extict, after having held their original lands for a period of six hundred years. Of the lairds of Macfarlane there have been no fewer than twenty-three. The last of them went to North America in the early part of the 18th century. A branch of the family settled in Ireland in the reign of James VII, and the headship of the clan is claimed by its representative, Macfarlane of Hunstown House, in the county of Dublin. The descendants of the ancient chiefs cannot now be traced, and the lands once possessed by them have passed into other hands. BADGE: Muilleag (Oxycoccus palustris) Cranberry bush. ONE of the loveliest regions in the West Highlands at the present hour is the district about the heads of Loch Long and Loch Lomond, which was for some five centuries the patrimony of the Chiefs of the MacFarlan Clan. With the waves of one of the most beautiful sea lochs of the Clyde rippling far into its recesses, and the tideless waters of the Queen of Scottish Lochs sleeping under the birch clad slopes on another side, while high among its fastnesses, between the towering heights of Ben Arthur and Ben Voirlich, shimmers in a silver lane the jewel-like Loch Sloy, this ancient territory could not but in the course of centuries produce a race of men instinct with the love of the mountains and the moors, and all the chivalrous qualities which go to make the traditional character of the Highlanders of Scotland. This is nothing less than fact in the case of Clan Farlan, for in origin the Clan was not Highland at all, and only became so, like a number of others, by long residence among the mountains and the lochs, and by intermarriage with native families of Celtic descent. It is true that many tellers of the story of the clan seek to derive its origin amid the silver mists of a mythical Celtic past. According to one account, the clan takes descent from a hero who arrived in Ireland with the first colonists from Spain, and whose descendants afterwards settled in Scotland. MacIan, who mentions this tradition, wisely concludes that it "must be classed among the Milesian Fables." This tradition was amplified in a paper read by the Rev. J. MacFarlane Barrow at a meeting of the London branch of the Clan Society, and printed in the Clan MacFarlane Journal for January, 1914. Quoting from a MS. of the monks of Glenmassan, this writer declared that in the veins of the MacFarlans ran "the blood of Earls, and not Earls only, if it came to that, but of Kings, for was not Alwyn Mor, first Earl of Lennox, the great-grandson of Mainey Leamna, the son of Corc, King of Munster, who was fifth in descent from Con of the Hundred Battles, King of Ireland?" To descend from these misty altitudes of vague tradition, however, to the realm of ascertained fact. It is recorded by the greatest of Scottish archaeologists, Chalmers, in his Caledonia, quoting from the twelfth-century Simeon of Durham, that the ancestor of the family was the Saxon Arkil, son of Egfrith. This Arkil, a Northumbrian chief who fled to Scotland to escape the devastations of William the Conqueror, received from Malcolm Canmore the custody of the Levanax or Lennox district, and became first founder of the family bearing that title. Alwyn, son of Arkil, was a frequent witness to the charters of David I. and Malcolm IV., and was created Earl of Lennox by the latter King. The son, another Alwyn, of the first Earl of Lennox being a minor at his father�s death, William the Lion gave the earldom in ward to his brother David, Earl of Huntingdon, but the young Earl recovered possession before the year 1199. When he died in 1224, he left no fewer than eight sons. Of these, Malduin, the eldest, became third Earl of Lennox, and Gilchrist, the fourth son, obtained from the latter in 1225 a charter of the lands of Arrochar, and became ancestor of the MacFarlans. Along with Clan Donachy, the MacFarlans are said to have been the earliest of the clans to hold their lands by feudal charter. Like other vassals of the Earls of Lennox, the MacFarlan chiefs exercised their rights under the stipulation that all criminals condemned by them should be executed on the Earl�s gallows at Catter. One of the earliest traditions connected with the family has to do with the great Norse invasion of Hakon, which ended at the battle of Largs in 1263. Previous to that battle, Hakon sent Olaf, King of Man, with sixty ships, up Loch Long. The Norsemen drew their vessels across the narrow isthmus of the MacFarlan country, between Arrochar and Tarbet on Loch Lomond, and the spot is pointed out, at the milestone midway, where the Laird of Arrochar hid his family from the fierce Norse raiders. Duncan, the second Laird of Arrochar, married Matilda, sister of Malcolm, fifth Earl of Lennox�he who was the friend of Wallace and Bruce, who fought at Stirling Bridge and Bannockburn, and fell at Halidon Hill, and there is reason to believe that the Laird of Arrochar and his followers fought under the Earl of Lennox at Bannockburn. It was to the country of Duncan of Arrochar that Bruce escaped on the memorable occasion when he crossed the narrow waters of Loch Lomond, and recited to his men the great romance of Fierabras; and it is pretty certain that Duncan would be one of the little group of the Earl�s hunting party which shortly afterwards met the King, and hospitably entertained him and his little army, in the hour of their need, with the fruits of the chase. The son of Duncan and Matilda was named Malcolm, probably after his uncle the Earl; and Malcolm�s son, the fourth Laird, was named Pharlan, which has been translated Bartholomew. It is from this individual that the family have since taken their surname of MacFarlan. Pharlan�s son Malcolm had a charter confirming him in possession of the lands of Arrochar in 1354, and his son Duncan, the sixth Chief, married Christian, daughter of Sir Cohn Campbell of Lochow, and died shortly before 1460. His son John married a daughter of Sir James Mure of Rowallan, and sister of Elizabeth Mure, first wife of King Robert II. The next Chief, Duncan, was served heir to his father in 1441, and the next, Walter, married a daughter of the second Lord Livingstone. Meanwhile the original house of Lennox had suffered a tragic catastrophe. Donald, the sixth Earl, had left only a daughter, Margaret. She married her cousin, Walter de Fassalane, on the Gareloch, who, as the earldom appears to have been a female fief, became seventh Earl in right of his wife. The son of this pair, Duncan, eighth Earl, was again the last of his line. His daughter Isabella became the wife of Murdoch Stewart, Duke of Albany, grandson of King Robert II., and for a time Regent of Scotland. On the return of James I. from his long captivity in England, Duke Murdoch, his two sons, Walter and Alexander, and his father-in-law Duncan, Earl of Lennox, were all arrested, tried, and executed on the Heading Hill at Stirling. Afterwards, on the death of the Duchess Isabella in 1460, her youngest son�s son, Lord Evandale, held the earldom in liferent till his death. Upon that event occurred the Partition of the Lennox; one-half of the territory went to the daughters of Earl Duncan�s second daughter, Margaret. These daughters were married respectively to Napier of Merchiston and Haldane of Gleneagles. The other half went to Elizabeth, Earl Duncan�s youngest daughter, married to Sir John Stewart of Darnley. In 1473 Darnley obtained a royal precept declaring him heir, not only of half the lands, but of the title of Earl of Lennox. Meantime the heir-male of the old Earls of Lennox was the Chief of MacFarlan, and some writers on the Clan suppose that the latter took the field in order to assert his claim, and suffered the loss of his territory in consequence. But there appears to have been no break in the line of the Chiefs. The idea that a cadet assumed the chieftaine appears to have arisen from a later Latin charter in which Sir John MacFarlan was styled "Capitaneus de Clan Pharlane." This, Skene in his Highlanders of Scotland took to mean Captain of Clan Farlan, but Dr. MacBain, editor of the latest edition of the work, points out that Capitaneus is really the Latin for Chief. As a matter of fact, Andrew MacFarlan of Arrochar married a daughter of John, first of the Stewart line of the Earls of Lennox, and his successor, Sir John MacFarlan already alluded to, was knighted by James IV., and fell along with the Earl of Lennox himself at Flodden Field. The Chiefs of MacFarlan, indeed, appear to have been zealous supporters of the Lennox Earls. It was probably in this character that, shortly after Flodden, the MacFarlans attacked the castle of Boturich on the south shore of Loch Lomond, which was part of the ancient property of the earldom that had fallen to the share of Haldane of Gleneagles. The incident is narrated in Sir David Lindsay�s well-known poem, "Squyer Meldrum." The Laird of Gleneagles had fallen at Flodden, and the Squyer was making love to his widow in Strathearn when news came that her castle of Boturich was being attacked by the wild MacFarlans. Forthwith the valiant Squyer got his forces together, and rode to the rescue, driving off the marauders and securing the fair lady�s property. The next Chief, Andrew the Wizard, has recently been made the hero of a romance, The Red Fox, by a member of the Clan. He married a daughter of the Earl of Glencairn, and his son Duncan, who married a daughter of Lord Ochiltree, was an active supporter of the Regent Lennox during the childhood of Queen Mary. The MacFarlans, indeed, were among the first of the Highland clans to accept the Protestant form of worship. When Lennox, afterwards father of Queen Mary�s husband, Darnley, took arms in 1544 to oppose the Regent Arran and the Catholic party, the MacFarlans, under Walter MacFarlan of Tarbet, joined him with 149 men. These were Cearnich or light-armed troops, provided with coats of mail, two-handed swords, and bows and arrows, and it is recorded that they could speak both English and Erse, or Gaelic. Three years later, in 1547, the Chief himself fell, with a large number of his Clan, at the battle of Pinkie. It was the next Chief, Andrew, who became famous by the part he played in fighting on the side of the Regent Moray at the battle of Langside in 1568. According to the historian Holinshed, "The valiance of ane Heiland gentleman named MacFarlan stoode the regent�s part in great stede, for in the hottest brunte of the fighte he came up with 200 of his friendes and countrymen, and so manfully gave in upon the fiankes of the Queen�s people, that he was a great cause to the disordering of them. This MacFarlane had been lately before condemned to die for some outrage by him committed, and obtayning pardon through the suite of the countess of Moray he recompensed that clemencie by this piece of service now at this batayle." MacFarlan�s neighbours, Colquhoun of Luss and the Laird of Buchanan, also fought on the side of the Earl of Moray at Langside. For his part, MacFarlan received from the Regent the right to wear a crest consisting of a demisavage proper, holding in one hand a sheaf of arrows, and pointing with the other to a crown, with the motto, "This I�ll defend." This was the most turbulent period of the Clan�s history, when the frequent raids made by its members upon the lowlands brought them an unenviable notoriety. From the fact that these raids usually took place on clear nights, the full moon came to be known over a considerable part of the western lowlands as "MacFarlan�s lantern." Further, the Clan�s "gathering" was significantly "Thogail nam Bo," "lifting the cattle." The slogan of the Clan was" Lochsloidh," "The Loch of the Host," so named from the fact that the gathering-place of the MacFarlans was upon the shores of that sheet of water. The Laird of MacFarlan appears in the rolls of chiefs made out in 1587-94 with a view to enforcing the law which made each chief accountable for the peaceful conduct of his followers. In the latter year they appear along with the MacGregors in the statute for the punishment of theft, reiff, oppression, and sorning. The MacFarlans also have been accused of a part in the assassination of Sir Humphrey Colquhoun in his castle of Bannachra in Glenfruin in 1592, though, according to the diary of Robert Birrell, burgess of Edinburgh, quoted in Irving�s History of Dunbartonshire, the assassination was the work of Colquhoun�s own brother John. In July, 1624, many of the Clan were tried and convicted of theft and robbery. Some were punished,. some pardoned, and a number were removed to the uplands of Aberdeenshire and to Strathaven in Banffshire. Among other septs of the Clan are the Allans or MacAllans, settled in Mar and Strathdon, and a large number of others are enumerated by the Loch Lomondside chronicler, Buchanan of Auchmar. They assumed the names of Stewart, M�Caudy, Greisock, MacJames, M�Innes, and others. The origin of one of the names of septs of the Clan, that of the Mac-an-Oighres or Macnaires of the Lennox, is said to have been as follows. One of the chiefs left his second wife a widow with one son, while the heir by his first wife was vain and a little weak-minded. The younger brother owned a beautiful grey horse, and on one occasion, the elder, setting out for Stirling, desired to ride it in order to make a good appearance. The stepmother, a Highland Rebecca, refused the loan on the pretext that the steed might not come safely back, and at last the young Laird signed a deed agreeing to forfeit the lands of Arrochar to his half-brother if the horse were not returned. The stepmother thereupon bribed the groom to poison the horse while away. This was done, and her son entered upon possession of the estate. The Clan, however, refused to accept him as their Chief, and some years later the treacherous document was legally annulled and the lands restored to the rightful heir. From this incident certain MacFarlans were known to a recent time as Sloichd an Eich Bhain, "descendants of the white horse," while those who supported the heir took the name of Clann an Oighre. John, the son and successor of the Chief who fought at Langside, founded an almshouse at Bruitfort on Loch Lomondside, opposite Eilean Vow, and endowed it as a hostelry for passing travellers. His son Walter was a strong supporter of Charles I. in the Civil War, and in consequence had his castle destroyed by Cromwell�s men, and was fined 3,000 merks. John, the grandson of Walter, again, took part against the Stewarts in the Revolution of 1688, and was Colonel of a volunteer force raised in his neighbourhood. His son and successor, Walter, was famous as an antiquary, and among other works the Lennox Chartulary survives only in his transcript. When he died in 1767, his library was purchased by the Faculty of Advocates, and is still of much use to antiquarian students. His materials were used by Douglas in his Peerage of Scotland, and his portrait hangs in the museum of the Society of Antiquaries. Alexander MacFarlan, the brother of the antiquary, was a successful merchant in Jamaica, becoming one of the assistant judges of the island, and a member of the Legislative Assembly. He was an eminent mathematician and Fellow of the Royal Society, and at his death in 1755 left an interesting collection of instruments to Glasgow University. William, the Chief who succeeded the antiquary Walter in 1767, was a physician in Edinburgh. He had three sons and three daughters. John, the eldest, who succeeded, married Katharine, daughter of James Walkinshaw of Walkinshaw, and, among others of a family, he had Margaret Elizabeth, who died 12th May, 1846, aged 29. A monument on the west side of Grey Friars Church, Edinburgh, narrates that "at the period of her decease she was the lineal representative of the ancient and honorable house of MacFarlan of that Ilk." It was in 1785, in the time of the last-named Chief, John, that the Arrochar estate was brought to a judicial sale. It was purchased by Ferguson of Raith for �28,000, and at a later day was acquired by Colquhoun of Luss for �78,000. The extinction of the house of the Chiefs is associated by tradition with a curious incident. MacFarlan, it is said, had on the waters of Loch Lomond a famous flock of swans with which the luck of the family was associated. In the time of the last Chief, one Robert MacPharrie, who had the second sight, declared that the days of the Chiefs of Arrochar were numbered, and that the sign of this event would be the coming of a black swan to settle among MacFarlan�s swans. Strangely enough, soon afterwards, a black stranger was seen among the other birds on the loch, remaining for three months before it disappeared, and it was very shortly after this that the barony passed out of the hands of the MacFarlan Chiefs for ever. Nor a chair to sit doun." The authorship of the Waverley novels was then a secret; a few weeks later, when Rob Roy was published, and Mr. MacFarlane saw his verses at the head of the twenty-third chapter, he must have had a shrewd guess as to the authorship. The main stronghold of the Chiefs of MacFarlan was of course the castle of Arrochar, nothing of which now remains but a fragment of wall. The later Arrochar House, by which it was replaced, is still to be seen embedded in the modern mansion of the name on the shore of Loch Long. Besides this stronghold the Chiefs owned castles on the island of Inveruglas and on Eilean Vow in Loch Lomond, fragments of both of which still remain. The most recent chapter in the history of the Clan has been the formation of a Clan MacFarlan Society in Glasgow and London. The Society has Mr. Walter MacFarlan, D.L., Glasgow, as its Honorary Vice-President, while its acting President is Mr. James MacFarlan, representative of the Gartartan branch of the ancient family of the Chiefs, descended from Sir John MacFarlan, who fell at Flodden. One of the tasks which the Society has set itself is the investigation of claims to the chiefship, which has been obscure for more than a century. Septs of Clan Farlane: Allan, Allanson, Bartholomew, Caw, Galbraith, Griesck, Gruamach, Kinnieson, Lennox, MacAindra, MacAllan, MacCaa, MacCause, MacCaw, MacCondy, MacEoin, MacGaw, MacGeoch, Macgreusich, Macinstalker, MacIock, MacJames, MacNeur, MacNair, MacNiter, MacNider, MacRobb, MacWalter, MacWilliam, Miller, Monach, Robb, Parlane, Thomason, Stalker, Weir, Weaver. 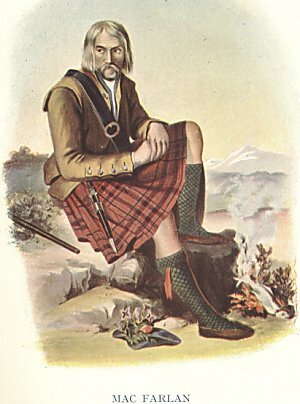 The war-like clan, Macfarlane claim descent from Giolchrist brother of the 13th Earl of Lennox, who held territories at the head of Loch Lomond. The clan takes its name from Parlan, grandson of Gilchrist. Duncan, 6th chief obtained the lands of Arrochar from the Earl of Lennox and in 1395 he acquired many of the ajoining lands by marriage. On the death of the last of the old Earls of Lennox without male issue, Macfarlane claimed the title and lands. This was rejected and the title was conferred on Sir John Stewart of Darnley which led to a long emnity between the contesting families. During the 16th century the clan found an outlet for their war-like spirit in supporting the Earls of Lennox. The Macfarlanes distinguished themselves at the Battle of Langside in 1568 fighting against Queen Mary. Later many of the clan fell at the Battle of Pinkie in 1547. During this time the Macfarlanes embarked upon a feud with the Colquhouns and in 1592 were responsible for the murder of Sir Humphrey Colquhoun and later a further feud developed with the Buchanans. These and many other acts of lawlessness committed by the Macfarlanes resulted in the clan being made landless and their name proscribed through an Act of Estates in 1642. The clan scattered and many clansmen adopted aliases. In 1785 the lands of Arrochar had to be sold for debt and the chief emigrated to America. The daughter of the last chief made a nomination in favour of the Macfarlane of Keithton and a claim is now pending with the Lyon Court.